How to add logo to PowerPoint ? Why people keep saying that they cannot protect the PowerPoint files with unique logo? It is understandable that copyright is increasingly important in real world but adding logo in PowerPoint should not bother that much. Read through this post to find out effective ways to put logo on PowerPoint. Adding logo to PowerPoint turns out to be very easy and handy. Look at the following common ways to put logo on PowerPoint effortlessly. - Manually add logo to PowerPoint on a single slide or all slides. Step 1: Open Microsoft Office PowerPoint. Step 2: Select a slide where you are going to put logo. Step 3: Insert logo to PowerPoint or copy and paste logo to PPT. Click the logo to zoom in or zoom out, or drag it wherever you want. Step 2: On the View tab, click “Slide Master”. I know you would not be happier if you can create your own logo and put that logo on PowerPoint to announce to all that this presentation belongs to you and only you. By the way, you will be happy to see your PowerPoint presentations being converted to a video format, which allows you to share and enjoy on any media player or video sharing site. All these can be accomplished by Leawo PowerPoint to Video Pro. This program is very creative in customizing PowerPoint files. 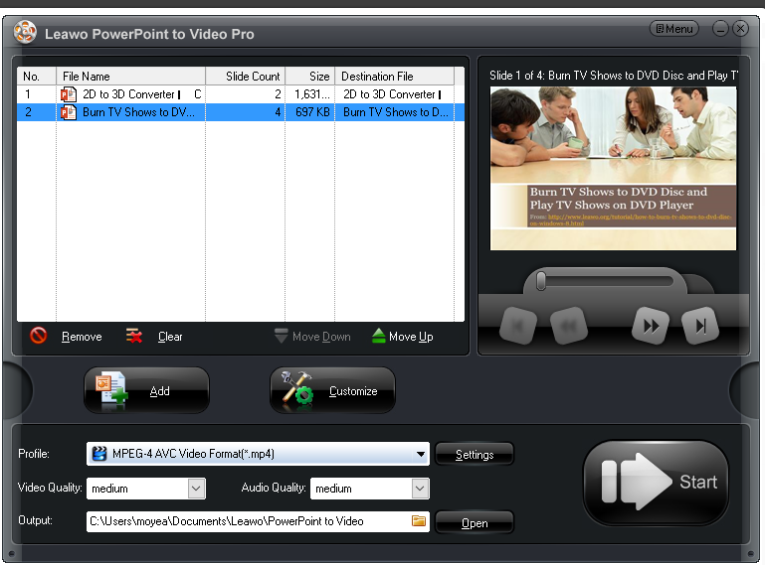 Users are able to convert powerpoint to video with background music, or even record narration to the slide. Setting audio parameters such as bit rate is also supported. It is interesting to create your own logo on slides, by which you can protect your files forever. In the following, a tutorial guide is given to show how to create a logo in PowerPoint and put company logo in presentation. Step 1: Install Leawo PowerPoint to Video Pro on your computer. Get this program from here. Windows XP/Vista/7/8/8.1/10 are supported. Step 2: Add source PowerPoint presentations to the program. Click “Add” to import your source PPT files. I suggest you import them in batches to save time. Don’t forget to set the output directory at the bottom Output box. Step 3: Pick up the target output format. Pick a format from the Profile drop-down list. Use ASF as an example in this case. box. Click “Customize” to set parameters in details. If you prefer to add background music or your recorded narration to the slide, click Music on the Presentation tab. Note that it is recommended to set transition in PowerPoint file. Step 5: Create a logo to PowerPoint. On the “Watermark” tab, create your own logo and insert it to PowerPoint by clicking “Add”. If you enable transparent color, the logo will become immersed to the overall background of the slide, making the whole picture look harmonious. Change the size and position as you want. Step 6: Convert the file to video. Click “Start” to convert the PowerPoint to video finally. The output video will be displayed with the customized logo on it. You will not be worried about the copyright or something because the video has already been protected. Personally I like to convert PPT to video and add logo to PowerPoint so that all my presentations can be saved in smaller space and can be protected well. For the sake of convenience, adding logo to PowerPoint within Microsoft PowerPoint is a good choice, no matter you insert a logo to a single PowerPoint slide or to cover all slides. This won’t take you a lot of time but you should also be aware that you can only add logo to PowerPoint step by step because it is impossible to batch processing all your PowerPoint files. 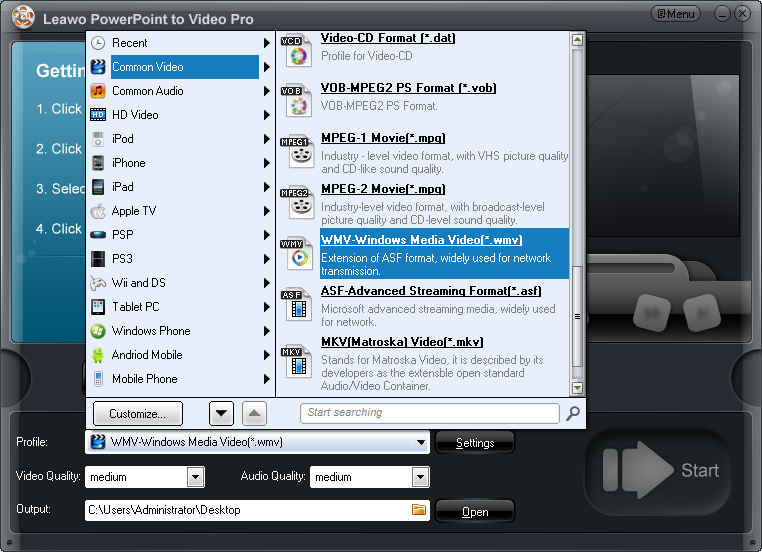 That is why I further introduce Leawo PowerPoint to Video Pro to you. 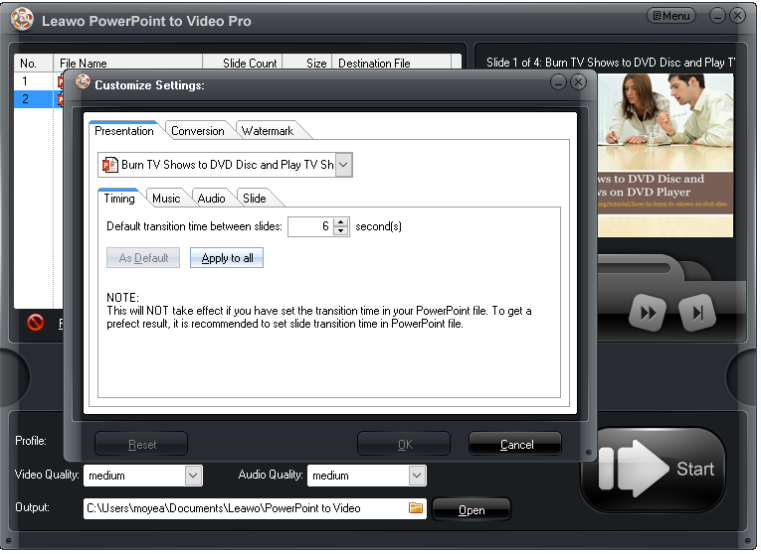 This professional PowerPoint to video converter allows users to process PPT files in batches. You will not need to worry about the repeated work for adding logo to PowerPoint files as all can be accomplished within several clicks. Once the progress completes, you can have a video with full of PowerPoint presentations and each slide has a logo on it. Moreover, all elements on original PowerPoint slides will be 100% reserved and you will not miss any transitions, animations, or video clips after PowerPoint files are converted to video. Enjoy and have fun. I am confident to say this program will be a surprise to you. It is super good.